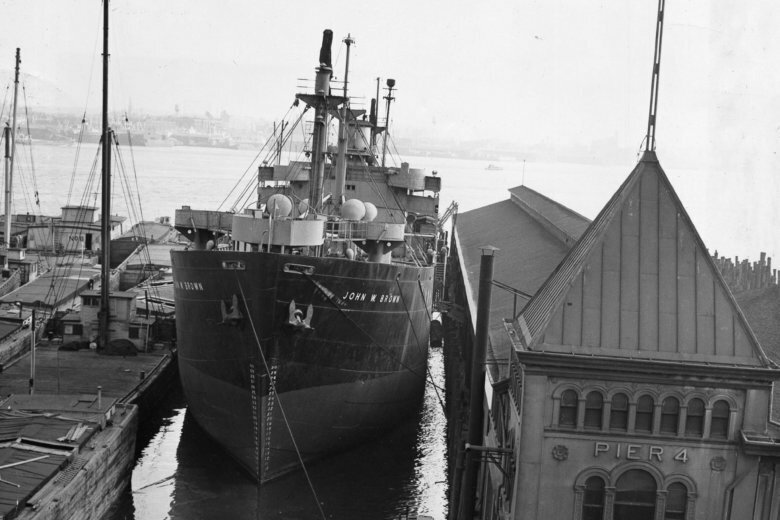 The 440-foot-long gray vessel is one of only two fully operational Liberty ships, which transported vast numbers of military personnel and countless tons of cargo during the war — and the only one sailing regularly out of the port city where it was built. BALTIMORE (AP) — Joe Colgan never considered Liberty ships, those workhorses of the American war effort during World War II, as his friends. Until he met the SS John W. Brown. “The last Liberty ship I got off, I swore to God I would never get on another one,” the 93-year-old Navy Armed Guard veteran said from his home in Bel Air, recalling the day a friend suggested he visit the ship, at the time a new arrival in Baltimore. Volunteers were working to make it seaworthy once again, with an eye toward creating a combination floating museum, classroom and training vessel. Half a century earlier, he’d disembarked from a Liberty ship in San Francisco, happy to leave the war behind. But finding a permanent home won’t be easy. Fewer than a dozen commercial piers in the area are large enough to handle the ship, said Michael Barnes, a member of the nonprofit’s board. Weighing more than 7,000 tons and armed with 12 on-deck guns, the ship attracts tourists — some just want to see what it looks like, while others book passage on its occasional cruises down the Chesapeake Bay. Children, including some STEM students, and would-be mariners have gained their sea legs on the ship as well, in much the same way their grandparents and great-grandparents did during the war. After floating dormant in New York and, later, Norfolk, the ship found a home, and the people to care for it, in Baltimore. It arrived here in August 1988 and following extensive renovations, almost all accomplished with volunteer labor, was back to sailing under its own power in August 1991. Bauman is confident about finding a solution. Good luck, he says, has followed the John W. Brown, from surviving the war to finding a home here in Baltimore to finding enough volunteers to make it seaworthy once again.